Over the past several months, we have reported a number of PS3 Slim rumors. The PlayStation 3 Slim generated more rumors than any other product in recent memory, dating back to the first one we reported in February of 2008. So what was true and what was false? Check out what happened when we played judge, jury and executioner with these rumors. Is the PS3 Slim real, and will we get a price drop? The rumor: Several sources over the past few months have been claiming that a new, slimmer PS3 would come out, and that it would be cheaper. Our verdict: Confirmed. Sony announced the PS3 Slim and a price drop to $299 during their press conference at Gamescom yesterday. The price drop is immediate, and the new model will come in September. Are original PS3 console supplies drying up worldwide? The rumor: Stores around the world have been reporting a lack of original PS3 units with no new shipments in sight. Our verdict: Confirmed. This was to make room for the new PS3 slim units shipping next month. Is Japan&apos;s PS3 Supply Drying Up? Would the PS3 Slim be ready by July? The rumor: Taiwanese site UDN stated that Sony had contracts with two companies to produce the PS3 slim, and that it would be ready by July. Our verdict:Likely Correct. While the PS3 Slim isn't being released to the public until September, in order to have units ready to ship to media outlets, the systems surely needed to be ready by July. Were those first pictures of the PS3 casing and box real? The rumor: In May, pictures of a redesigned PS3 started popping up on message boards in China. They appeared to be from a production plant. Our verdict: They were real. After posting the pictures, we received a cease-and-desist order from a Taiwanese law firm. Sony never commented. The pictures are very similar (if not identical to) the images released by Sony during Gamescom. The unboxing we posted seems to show the same box, as well. Was that a real PS3 Slim being sold in the video of the Filipino marketplace? The rumor: A marketplace in the Philippines was selling a PS3 Slim back in July. Our verdict: Iffy. While the console in the video closely resembles the one Sony revealed (down to having no card reader, two USB ports, and a new logo), we cannot determine whether or not it was a counterfeit. 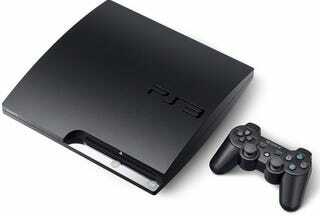 Does the PS3 Slim have backwards compatibility? The rumor: Only a few early models of the PS3 had the ability to play PS2 games, and many hoped that the PS3 Slim would bring that back. Our verdict: False. SCEA director of marketing John Koller told us that customers were focusing on their PlayStation 3 systems, and that backwards compatibility would not be reintroduced. Is there a 250GB PS3 Slim As Well? The rumor: FCC reports include a 250GB model of the PS3's slimmer model. Nothing has been announced about it, but it might be coming. Our verdict: Possible. The FCC's documents have provided valuable insight into the future of hardware before.